>Well the cardboard pyramid is proving to be as strong as I hoped – the boys find it greatly entertaining as they find new holes through which they can poke things. The sooner I finish and seal it off the better. Today I’ve been thinking about the table top. I’m making up a frame that sits over the whole thing. If you look at this photo I think it may be the most over-engineered thing I’ve ever built! Anyway the insides of the hole where the pyramid sits will need to be chamfered so that it fits on the pyramid and is still horizontal. I’ve included some of my working in this post. At first I was thinking angles and tangents and working it out. Then I realised that the bit I need to remove from the edge of the wood is a congruent triangle with the whole pyramid taken in cross section. So the ratio of half the base to height is the same as x to thickness of wood. 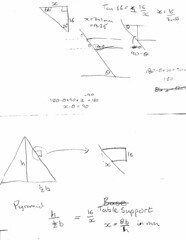 As I know the wood is 16mm thick and the pyramid is 570x690mm and 650mm tall it’s not too hard to get to the answer, and more elegant than working out tangents, etc. 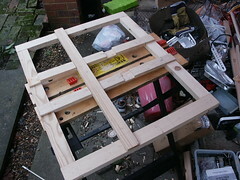 Anyway it’s now the weekend and I’m hopeful of getting the woodwork finished so I can start on assembly.